Bordering the Mosi-Oa-Tunya National Park, with a view over the spray of the Victoria Falls in the distance, the exclusive Stanley Safari Lodge will take you back to the Africa of the 1920's. Set on a hill overlooking unspoilt bush, only 3kms from the river and the Victoria Falls, Stanley Safari Lodge offers outstanding personalised service. Guests stay in one of ten private cottages, all with views of the spray of the Falls. Each cottage has a different theme, and Stanley Safari Lodge offers half-open cottages with a truly African feel and colonial open or closed suites with private plunge pools. Guests can enjoy sundowners in the African style lounge or European-style cuisine with an African twist in the dining room or spend some quiet time in the library or upper deck. They can dine outdoors under the stars, in the privacy of their suite, in the wine cellar or even in the infinity pool. Stanley Safari Lodge makes an unforgettable base from which to explore the Zambezi River, Victoria Falls and the Mosi-Oa-Tunya National Park. And the game viewing begins on-site, as elephants and other game frequently visit the nearby waterhole. The lodge also offers walking safaris to see rhinos, which proves very popular with guests. Open: Stanley Safari Lodge is open all year round. Location: The lodge is located away from the hustle and bustle of Livingstone, but just 3km away so you have easy access for all activities. Rooms: There are 10 rooms consisting of 4 suites and 6 cottages. The lodge can accommodate a maximum of 24 guests. Activities: In and around Livingstone guests can game drive or walk in Mosi Oa Tunya National Park, take a day trip to Chobe in Botswana, visit a local village, the Livingstone Museum, local market. Don't forget the mighty Victoria Falls, you can also take a helicopter ride or microlight flight, canoeing, river safari, sunset cruise, bungee jumping, abseiling, gorge swings - there's plenty to do. Facilities: There is a restaurant, beautiful gardens, infinity pool, wine cellar. Dining: Meals are served in a variety of locations both indoors and outdoors, including your own suite if you wish. Children: The lodge welcomes children of all ages. Communication: There is mobile reception at the lodge and WiFi is available in the main areas. "A perfect place to start my trip & from which to view & visit the Falls." "This was our first taste of Africa - and a lovely, serene start. Clara, Desai and Sampson (and, I think, David) made us feel welcome, checked we were happy and chose lovely dining spots for us. It was very personalised care. The isolation, the view of the Falls from our deck and the lovely surroundings were bliss." 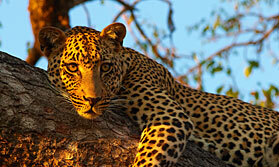 "Around 20 minutes drive from Livingstone airport sits the wonderful Stanley Safari Lodge. All the rooms are slightly different with the majority of them being open fronted. At the right time of year you can see the spray from Victoria Falls smoke up into the sky. Lying in bed at night you can certainly hear them rumble! There is a gorgeous infinity pool which looks out towards the falls. The staff are lovely and the food is fantastic! It's also a great spot to sit back, relax and watch the sun go down with that all important G&T in hand!" "What a view of the spray from Victoria falls. We loved having the place to ourselves (9 of us) and it felt like our own personal dinner party. "